MANILA, Philippines - The Philippine Overseas Employment Administration (POEA) released on Friday, April 7, the results - complete list of passers for the first round of 1st Point System EPS-TOPIK (Employment Permit System - Test of Proficiency in Korean) conducted on March 25 and 26, 2017 in Manila, Cebu, Davao and Baguio. UPDATE: A total of 7,003 passed the first round of the Point System EPS-TOPIK. The 1st Point System EPS-TOPIK test covers reading and listening. POEA said those who have passed the EPS-TOPIK 2017 must submit their documents on the nearest POEA branch (Ortigas Avenue in Mandaluyong, Cebu or Davao city) on April 10 to 12. Notes: The agency clarified that medical examination result is not yet needed. Please ensure the authencity of the documents, otherwise it can be a ground for disqualification on the first paper based test (PBT), disqualification in taking up skills test and 2 years suspension from the EPS program. Successful examinees of the 1st round should pass the 2nd round to be included in the final roster. 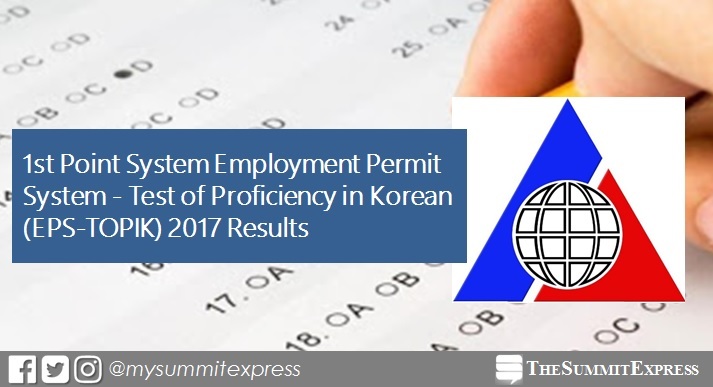 The examination is being implemented by the Human Resources Development Service of Korea (HRD Korea) and authorized by the Ministry of Employment and Labor of the Republic of Korea (MOEL).